Gold color. Nutty aromas and flavors of honey roasted nuts, caramelized peaches and figs, muesli, and clay with a silky, bright, fruity medium-to-full body and a tingling, complex, long finish revealing notes of creme brulee, spicy pie crust, and minerals finish. An elegant, nuanced Irish whiskies with a great combination of fruit and spice. Bottom Line: An elegant, nuanced Irish whiskies with a great combination of fruit and spice. 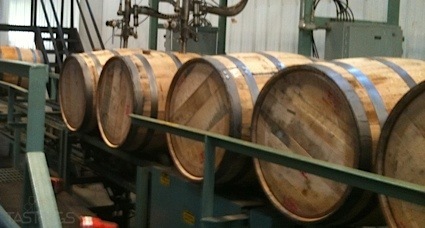 Single malt Irish whiskeys, like their Scottish cousins, are whiskies that are only made with malted barley. They are usually triple distilled through both column and pot stills, although there are a few exclusively pot-distilled brands. 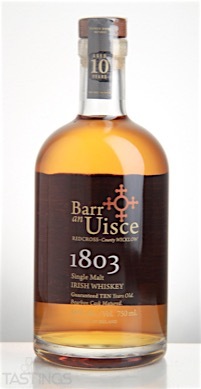 Barr an Uisce "1803" 10 Year Old Single Malt Irish Whiskey rating was calculated by tastings.com to be 94 points out of 100 on 8/30/2016. Please note that MSRP may have changed since the date of our review.